Oakland based quartet, Wander, find themselves floating atop the waves of the next generation of post-rock. The Bay Area group shares a long history as both friends and bandmates. While the four began playing music together in high school, they officially started performing under the name Wander in 2010. Their band name originates from the video game Shadow of the Colossus, in which the main character, named Wander, travels to a forbidden land and defeats sixteen bafflingly giant creatures known as collasi. This seems to be a deliberate choice; as their sound is as massive and vast as the collasi themselves. “We’re all of Filipino descent, or “Pinoy”. I feel that Asian American artists are often underrepresented in media – whether it be in film, music, etc. Which is unfortunate because there’s a lot of talent out there that isn’t recognized as much as it should be. Wander grew together as musicians through their two prior albums Mourning, and Glass. They also have a split release under their belts with their self identified ‘alternate universe’ friends in Young Lovers. These musical milestones have aided in the development of Wander’s incredibly tightly woven sound. Taking inspiration from post-rock legends Toe, Explosions in the Sky, and Mono the band agrees that creating music within the post-rock sphere heavily relies on projecting something that is memorable and boundary pushing. March fully achieves this. Front to back it’s unforgettable and enthrallingly fastidious. It’s doubtful that you’ll see Wander playing with massively oversized pedalboards. While their music does contains a diverse amount of textural elements and unique sounds, they utilize the perfect amount of effects to compliment their songwriting. Wander opts out of letting their pedals do all the work, instead playing to their effects. The title track is first up on March. With its cunning and clever buildups, each layer serves a distinctively important role in the song. Guitar parts sparkle and chime yet they do not refrain from pulverizing listeners in fortissimo passages. The drums conduct the band when volume swells up and release impressive, unabridged fills. Aguda’s bass lines glue it all together and choose the perfect notes to accentuate each undying moment. The recording style doesn’t feel stuck to a metronome-- but everything locks together in a perfect, organic synchronicity. After listening to the intro track on March it becomes evident that a tremendous amount of conceptualization goes into Wander’s music. Next, “Faraway” smashes your eardrums in the first thirty seconds, just before it neatly resolves itself. Through the entirety of the track Wander toys back and forth with this concept. Pulling teeth with tension and keeping you guessing which direction the song will choose to cascade down. While this song is March’s longest track, the 11 minute running time doesn’t result in any loss of steam whatsoever. As any instrumental post-rock tune should, it evolves and grows with each passing phrase. The 6 to 11 minute track times on March are a sweet spot for the genre. While Wander’s previous records are also fantastic, the new longer tracks show a maturity within the songwriting of Wander. They convey their ideas completely, without the need to write short songs this time around. There’s certainly no shortage of dazzling moments within March. Rather than explaining and dissecting each and every one for you, simply do yourself a favor and gather your own interpretation of these six songs. 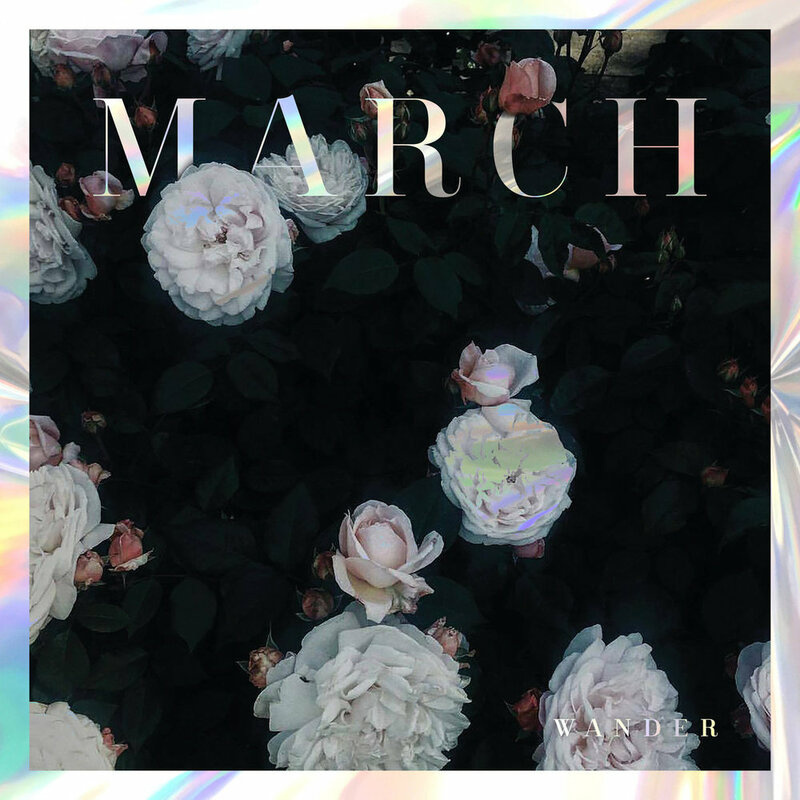 March takes you on an instrumental journey and the detailed nuances deserve to not be spoiled. In its entirety, March feels like the first record that completely does Wander’s sound justice. The album will send you through a wide range of emotions; it sparks feelings of longing and renewal. Just as the month of March sets forth the changes of spring, these songs give birth to something expansive and exploratory. This is a breakthrough post-rock release for the group and for the genre. If Wander was living in black and white before, they are now experiencing vivid color through March.